UPSC CDS II 2017 Result WR Engg PDF Download - Get Here UPSC CDS II Result in PDF format and check your result. 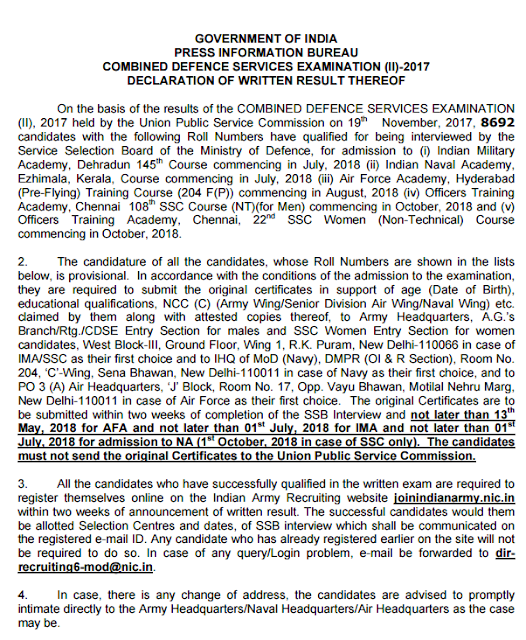 UPSC CDS II 2017 - COMBINED DEFENCE SERVICES EXAMINATION (II)-2017 DECLARATION OF WRITTEN RESULT , Check Below Result Notification . educational qualifications, NCC (C) (Army Wing/Senior Division Air Wing/Naval Wing) etc. IMA/SSC as their first choice and to IHQ of MoD (Navy), DMPR (OI & R Section), Room No. must not send the original Certificates to the Union Public Service Commission. be required to do so. In case of any query/Login problem, e-mail be forwarded to dirrecruiting6-mod@nic.in. No.011-23385271, 011-23381125 and 011-23098543 from this Facilitation Counter.